As a content provider, over the past 8 years I’ve written blog posts for a variety of agencies and their clients. Combining this experience with my love of inbound marketing, I’ve come up with a few tips I think will help agencies and other writers provide quality content on behalf of their end clients. Hubspot has done a great job jumpstarting a movement towards content marketing. There are hundreds of agencies now providing services to marketing automation customers using the inbound marketing concept. I’ve worked with dozens of these agencies in one way or another, getting insight to how they launch new clients, plan content, generate content and how it performs for their clients. The average quality of content is lacking- We Can Do Better! Through my experience I’ve learned what decent content is and how it makes a difference to a business. I’ve also seen awful content and I know what causes it, and what it causes- the loss of clients. I’m not talking about content that doesn’t make sense because the writer couldn’t speak English, or the occasional error. In fact the grammar, spelling, and optimization for most pieces I’ve seen has been fine. The quality of the information in many of these posts is what was lacking. Posts contained high levels of fluff and little education. They fail to move the reader. Two blog posts with identical information, rewritten to include different keywords for SEO purposes. Blog posts written specifically to meet SEO quotas while not providing useful information for the end reader. How to posts that do not go in-depth and teach the very basics in the industry. Content rewritten based on someone else’s article- this is still plagiarism even if it passes copyscape. Curated content with basic summaries and no added value such as the thought leadership of the client. Today thousands of companies are providing content for their visitors. Google rewards this by sending more spiders and traffic to these websites. To keep the traffic coming, companies write about everything they can. They write about content that is easily found other places online, because it keeps visitors on their sites longer. They write about evergreen topics, tools, news and every related idea they can. As long as they can afford content, they keep publishing it for the search benefits. Millions of pieces of content are added to the internet daily. When Facebook recently wrote about the influx of content approved for their feeds, few realized this was happening everywhere online. Google has so many new pieces of content per day, you only see a small fraction of it in your search results, if any at all. Twitter has so many links shared that you can’t possibly read every post you want to. The same for every other source of news on the internet, the content coming in is overwhelming. One aspect that has helped Google, Facebook, Twitter and other content curating tools suggest appropriate content are visitor behaviors. For Google they track how long visitors stay on a site, this turns into better rankings, Facebook and Google rely on actions taken by the visitor. If the visitor likes the content, shares it, or comments on it, it is more likely to be seen by others. Therefore, content needs to be quality, educational, entertaining and actionable. 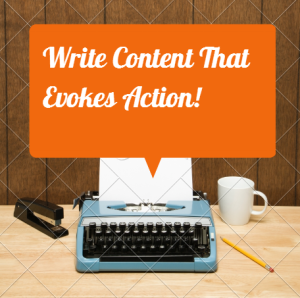 What encourages action on content? There are two factors that encourage action on your site. Relationships are commonly used to get initial shares on social media sites. Asking friends, colleagues and close social friends to share a new post gives your content access to their networks. The more relationships you have, the more easily your new content is discovered by people outside of your own network. Unfortunately when it comes to providing content to clients we don’t normally get access to their online relationships who would share the content. Have you ever read a piece of content where afterwards you just wanted to print it out, highlight the whole thing, post it on your wall and contact the author to tell them how excited you are to have found their site? That is a piece of content that no doubt delivers results, it doesn’t necessarily need relationships but it is probably initiating them. This is the kind of content that encourages action. It gets people excited about learning something new, it makes them want to share the post with everyone they know and it inevitably gets more traffic and conversions. Few sites are able to deliver this quality of content every time they put something out, but it doesn’t mean that shouldn’t be the goal. Clients hire freelancers, agencies and contractors to write content. Usually this is content they can’t write for themselves, because they don’t have the time or expertise in writing. They trust the people they hire (and at good cost) to provide content that will turn into conversions, contacts, leads and revenue for their businesses. In summary, they trust us to provide content that impresses. The question is: Does your content impress? Raise the Bar- Deliver Better Content- Here’s How! Chances are your content can improve, whether it is just for you or your client. All I’m saying is not only can it improve, but it really should. With that in mind here are a few tips that should help increase quality. Content for a client’s website needs to bring in search traffic, and convert that traffic. When it doesn’t clients eventually walk from the lack of results. So yes, some of the tips above can be more expensive up front, but down the road they save agencies money by helping them retain clients. And really, which is more important losing a few dollars that show off the quality your agency invests in or saving money now and losing clients? Is it time to re-assess the quality of the content you provide? Do you need to educate your team to make sure they understand proper formatting, buyer personas, and generating content that encourages action? There’s no better time to get started. If you have questions, feel free to post them below, or find me on social media. And, if you enjoyed this post- please share it with your followers. Enjoyed the blog article Mary. Couldn’t agree more about cheap content not being good for your business or you clients business. Invest in a proven content extraction process that is repeatable for getting the ‘good’ information from the subject matter experts you already have in house at your company. Then is really comes down to an editor to put an article together from that. We use a group of writers and editors now with a process like this and the guarantee satisfaction with the quality of their blog posts. Granted they are not ‘cheap’ but if you are still looking at content as an expense then you’ve still gotta take a step back and realize where it fits withing your strategy for the overall performance of your marketing. You’re site is nicely designed too I had a good first impression when landing here.